JScript Panel. The version required and any requirement changes will be kept up to date in the latest download link location. Accurate filter & search: text and queries (e.g. artist HAS beatles). These give the same results as DUI album list filter. All give sorted results so that query sort operations are N/A. Search and filter can be hidden. Filtering is done before the tree is populated, enabling the tree to comprise different sub-populations of the library. Filters also offer quick access to commonly used queries. Filters are customisable in panel properties. Use // to separate name from query. Existing filters can be edited or new ones added. Search finds items in the populated tree. Font size: set with DUI or CUI list font. Or use mouse-over with CTRL + mouse wheel to zoom the font size (resets if UI list font size changed). Filter can be zoomed independently. Customisable node symbols: windows themed or font symbol. Colour of custom nodes can be configured. Panel properties has further options, e.g. 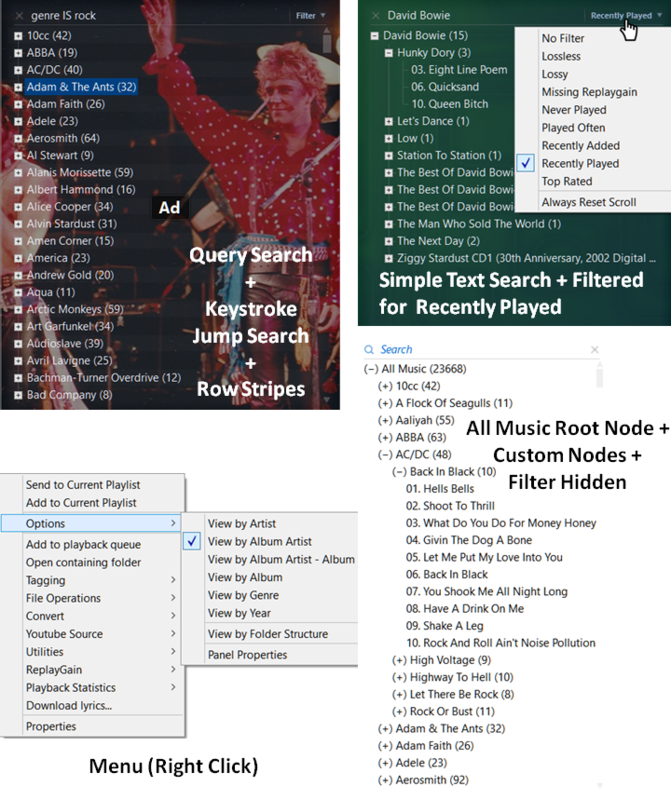 display settings for "All Music" node, item counts, alternating row stripes, tooltips, auto-collapse, margin, tree indent, autoplay, auto fit (autofit stops clipping of text in the bottom row). I'm using foobar2000 1.3.9, Library Tree 0.3, JScript Panel 1.1.1 on Win 7 x64. Columns UI is my interface. 1. 'Drag and drop' feature. Maybe an option to switch between the current behavior and a 'classic' behavior: click or double click on folder title (genre/artist/album) for expand/collapse a tree, middle click or drag and drop - add to playlist. It's kinda difficult to click small 'collapse/expand' buttons. Also now it's impossible to create (I mean the easy way) complex playlists, when you add 5 albums and then decide to add a 6th album between 3rd and 4th. If drag and drop is impossible to implement, then just 'classic' behavior will be enough. 2. The second option for items counting. It will be great if numbers in brackets can show correspondingly the number of sub-folders (artists) in genre folders, the number of albums in artist folders and the number of songs in album folders. Curious which component the Youtube Source context menu is from, seen in the screenshots. Does it search Youtube for the selected track? It looks like the script is using windows theming options but you're using windows classic?? Yup. Hmmm... so I'll have to play with the script to remove the theming options. Thanks. @ MrMonkey & Frame. Thanks for the feedback. Regarding item counts, I prefer these to sub-item counts. - Removed dependence on windows theme options. - Added double click expand and collapse. - Corrected a few minor draw issues. Is it possible not to list the music files in library tree panel? I usually play foobar on 'album'/'directory' base which means that I don't need to see the listed files. I know that I don't see the files if I don't click the last (+). But, it would be great if there is an option. WilB, thank you for the update. Unfortunately, it's impossible to use double click, because the playlist autofills every time I click on a folder/album/artist title. Or did I miss an option to disable the 'autofill' feature? Auto play on send works half way though. When using the context menu to send, the song will play but double clicking on a song will only send it to the playlist. @ Widerock Added option to panel properties "Node: Show Tracks": true / false. @ Frame The double click expand/collapse action works identically to dui and cui album list, i.e. these also auto-fill. To avoid auto-fill, expand/collapse by clicking the node. Either way, to achieve what I think you want, use middle-click to add items in the order you want (if the playlist already contains items, use left click for the first addition). Middle click action is enhanced in 0.5, so please update. Double click expand/collapse action now needs to be set in panel properties (see below). @ Blaxima Added option to panel properties to configure DblClick Action: Expand/Collapse or Send&Play (default) to achieve what you want. Thank you for the implementation. Is is possible to have double click open directories and then send and play once it reaches a song rather than one or the other? Is it possible to add drag & drop feature? I really miss that, so i'm stuck using standard albumlist.. but everything else is great, looks great and lots of options. That's not possible due to limitations of the component. You can drag/drop in to it but not out. Hey . Do you guys have a clue why I have this issue when using Library Tree? I have latest version of everything (installed everything today). Only thing I changed is to do some customization in my Foobar columns in the playlist. Ouch! Whoops! . You're right. Thank you. I don't know how come I ended up with that one! I installed the new one (0.5) and this time no errors. However... it doesn't show anything either . I did go into options and set it to use the "Process" playlist that you can see in my previous screenshot but it's still empty. I get the same behavior from the JS Smooth Browser too... hmm. Any clue why? 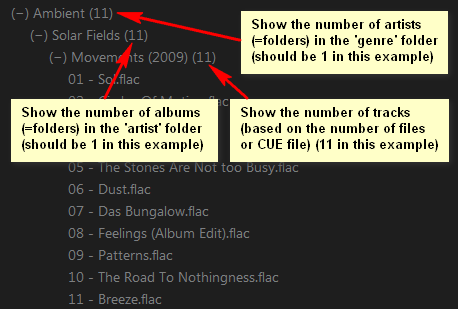 Have you configured foobar to monitor your music folders? Aaaaaaaaaaaaaaah . Nope. I did it now . Finally I get it!!! I thought that it will show stuff in that panel BASED ON what playlist I set, but it was completely the opposite way hahaha. The playlist you set is the playlist where IT PUTS the selection. You guys are awesome, thank you so much for the fast answers! Thank you very much, but this is not what I meant. I was hoping it would act the same way browsing on your computer would. If you double click on a folder it continues on to sub-folders until it gets to a file, then it opens the file you select/double click. As it is now, it just plays the first file right away while I make my way through the sub-folders trying to get to track 6. Oh, I think I understand what you mean now. It seems a good idea and I have hopefully implemented it correctly. Very nice to see such an active developer! . Good job brother!